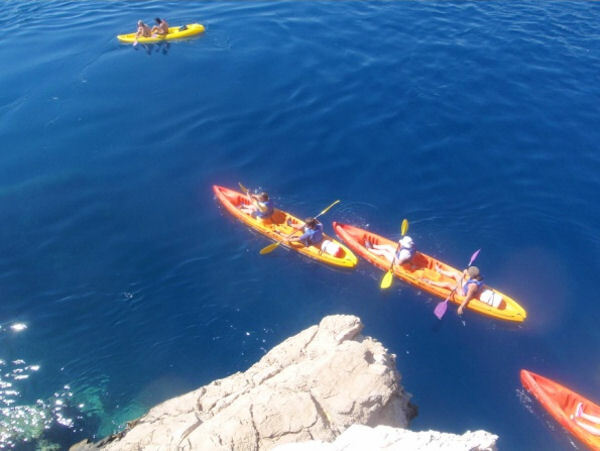 If you are not attracted to the river and you are tired of crowded beaches and the inevitable summer throng, sea kayaking is the perfect choice. After about half an hour of easy paddling you will reach remote and deserted pebbly beaches, accessible only by sea. You will explore caves, springs of a subterranean river and swim in the irresistible crystal blue sea. Lunch is grilled meat with potatoes, vegetables, salad, fruit & water, soft drink or beer. Please note: This tour requires you to enter and exit kayaks. This tour is recommended only to people in good physical shape. Remember to bring your camera, towel, swimsuit, water shoes and an additional set of clothes to change into. Please note: This tour requires you to enter and exit kayaks. This tour is recommended only to people in good physical shape. Guests need to be prepared for moderate amounts of walking. Tour is considered as strenuous activities tour. Restrictions: Maximum height is 2 meters (78.74 inches) and maximum weight is 110 kg (242 lbs. ).